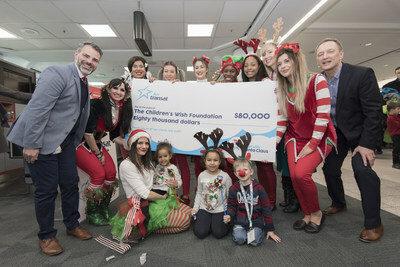 MONTREAL, Dec. 5, 2018 /CNW Telbec/ - It has become a real tradition just before the holiday season, Air Transat and the Children's Wish Foundation's Flight with Santa Claus taking place today. 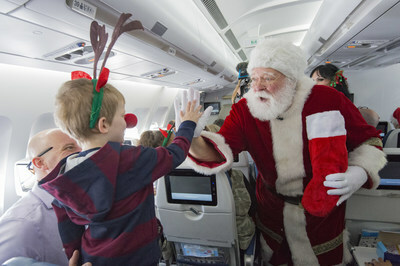 Hundreds of children were part of the festivities with the hope of finding Santa somewhere in the sky between Montreal, Toronto and Vancouver. 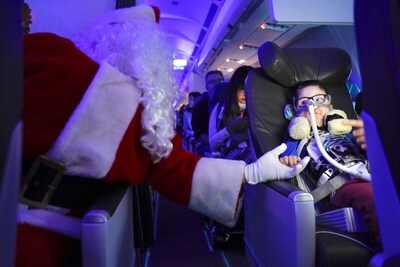 "The annual Flight with Santa Claus is truly a magical day that brings incredible joy to children diagnosed with a life-threatening illness," shares Chris Kotsopoulos, Chief Executive Officer at the Children's Wish Foundation. "It allows children and their families to create special holiday memories to cherish for years to come." The Small Change, Big Hearts program is supported by the donation of pocket change from Air Transat passengers at the end of each flight. Since December 2009, funds raised through the program have been donated in equal parts to The Children's Wish Foundation and to SOS Children's Villages, an international organization that assists orphaned and abandoned children in 134 countries. Since November 2017, it has also been possible to contribute to Small Change, Big Hearts when booking a package online on transat.com, with a travel consultant or with a Transat call centre agent. Since the creation of this program in 2004, Transat has donated more than six million dollars to both charities. 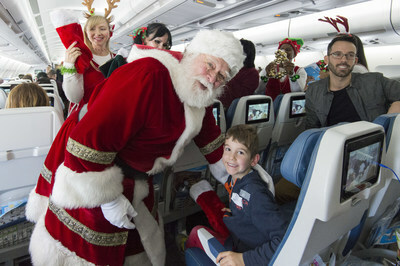 Air Transat is Canada's number one holiday airline. It flies to some 60 destinations in the Americas and Europe, offers domestic and feeder flights within Canada, and carries nearly 4.5 million passengers every year. Based in Montreal, the company employs 3,000 people. Air Transat is a business unit of Transat A.T. Inc., a leading integrated international tourism company specializing in holiday travel and offering vacation packages, hotel stays and air travel. Transat was awarded Travelife certification in 2018 in recognition of its commitment to sustainable development. Children's Wish Foundation of Canada is the largest and only all-Canadian wish granting charity dedicated to granting wishes to Canadian children between the ages of 3 and 17 who are diagnosed with a life-threatening illness. For more than 34 years, Children's Wish has worked tirelessly to grant heartfelt wishes to over 25,000 children and their families – that's three wishes each and every day, all year long! Now more than ever, we are encouraging Canadians to donate and support Children's Wish Foundation of Canada. You can help grant the next single-most heartfelt wish. Visit www.childrenswish.ca for more information and to donate.